To celebrate the arrival of the Donkey Kong Adventures DLC in Mario + Rabbids: Kingdom Battle, Ubisoft has released a new video featuring Davide Soliani and Grant Kirkhope. 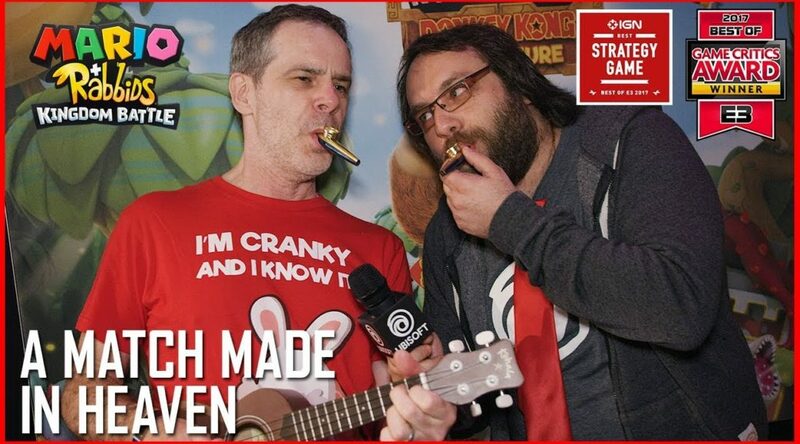 In the video, fans will learn how Grant Kirkhope, composer for Mario + Rabbids, formed a lasting friendship with the game’s creative director Davide Soliani. The new Donkey Kong Adventure is coming to Mario + Rabbids Kingdom Battle and it’s introducing some new funky fresh beats from composer Grant Kirkhope and new gameplay features from creative director Davide Soliani and his team. Find out how this match made in heaven (and hell) came to be when they interviewed each other at E3 2018. Mario + Rabbids: Kingdom Battle Donkey Kong Adventure is out June 26. Embark in an epic battle against a vengeful Rabbid Kong who uses his new powers to take over a mysterious island. Donkey Kong, Rabbid Peach, and a moody new Rabbid hero, Rabbid Cranky, will team up on a journey across four brand-new environments. Discover a world full of reinvented tactical gameplay, new enemies, and secrets to uncover.